During 1820 Keats displayed increasingly serious symptoms of tuberculosis, suffering two lung haemorrhages in the first few days of February. He lost large amounts of blood and was bled further by the attending physician. 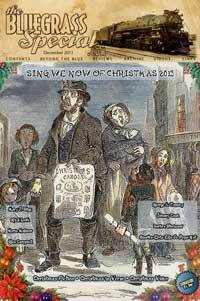 Leigh Hunt nursed him in London for much of the following summer. At the suggestion of his doctors, he agreed to move to Italy with his friend Joseph Severn, himself a portrait and subject artist. On 13 September, they left for Gravesend and four days later boarded the sailing brig “Maria Crowther,” where he made the final revisions of “Bright Star.” The journey was a minor catastrophe: storms broke out followed by a dead calm that slowed the ship’s progress. When they finally docked in Naples, the ship was held in quarantine for ten days due to a suspected outbreak of cholera in Britain. Keats reached Rome on 14 November, by which time any hope of the warmer climate he sought had disappeared. 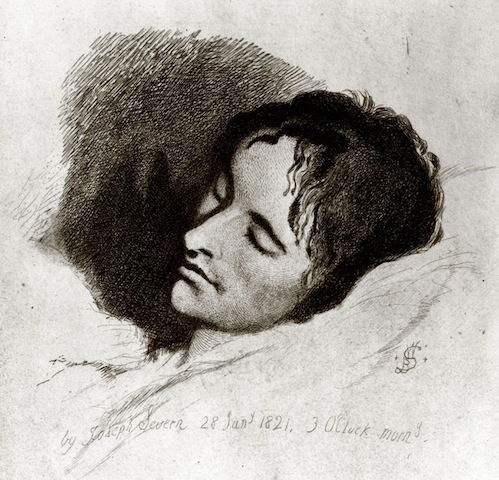 Over the course of Keats’s three-month dying ordeal, Severn kept the Keats circle in England informed of the poet’s deteriorating condition, with William Haslam and Charles Armitage Brown being the most favored recipients of such correspondence. Following Severn’s own passing on 3 August 1879, his papers–letters, journals, reminiscences and fragmentary records–were turned over, as Severn had requested, to his editor, William Sharp. The original plan was to publish this mass of material in two volumes, the first concentrating on, as its title would have indicated, Keats and His Circle, the second focused on Severn’s life from 1840 on to his final years in Rome (1871-79). Instead, it was decided to consolidate and abridge the material into a single volume, “a more concise record,” as Sharp explained. 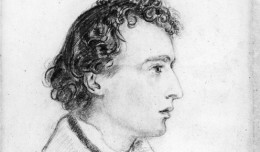 Recent Severn biographers have found some meaningful material in the expunged documents but nothing has surfaced to alter the drama and sorrow (and even some bouts of self-pity) Severn described in his letters as Keats slowly succumbed to the dreaded disease that had devastated his family, claiming his mother and his brother Tom before him. These wrenching missives include such unbearably poignant scenes as Keats being unable to read a final letter from his beloved Fanny Brawne and requesting Severn place it over his heart, and bury it with him; and, in writing to Brown with news of Keats’s passing, trying to describe the poet’s final moments but finally breaking down, unable to complete his last thought, and so concluding instead with a drawing of a mourning figure, a truly heartbreaking image. In The Life and Letters of Joseph Severn (Samson Low, Marston & Company, London, 1892), Sharp describes, with the help of Severn’s letters, the final days of John Keats as told by the only person attending the doomed poet as he breathed his last. Sharp’s voice is heard first; Severn’s is indicated in either quotation marks or italics. Throughout the long and trying period of Severn’s unflagging ministry to his dying friend he had been fertile in expedients, in trivial matters as well as in pecuniary troubles. He has himself told us how, overcome with fatigue, he would sometimes fall asleep in the night-watches, and, awakening, find himself enveloped in total darkness. This passage occurs in one of the most pathetic of all Severn’s letters to his friends. 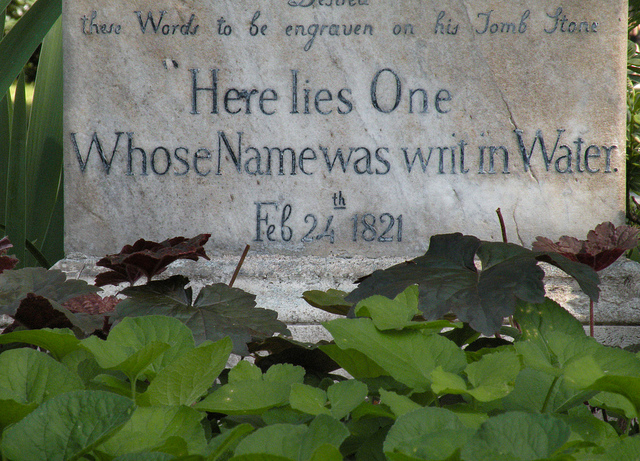 It was addressed to Haslam and written the day before Keats’s death. O, how anxious I am to hear from you! I have nothing to break this dreadful solitude but letters. Day after day, night after night, here I am by our poor dying friend. My spirits, my intellect, and my health are breaking down. I can get no one to change with me–no one to relieve me. All run away, and even if they did not, Keats would not do without me. Last night I thought he was going, I could hear the phlegm in his throat; he bade me lift him up on the bed or he would die with pain. I watched him all night, expecting him to be suffocated at every cough. This morning, by the pale daylight, the change in him frightened me; he has sunk in the last three days to a most ghastly look. Though Dr. Clark has prepared me for the worst, I shall be ill able to bear to be set free even from this, my horrible situation, by the loss of him. I am still quite precluded from painting, which may be of consequence to me. Poor Keats has me ever by him, and shadows out the form of one solitary friend; he opens his eyes in great doubt and horror, but when they fall upon me they close gently, open quietly and close again, till he sinks to sleep. This thought alone would keep me by him till he dies; and why did I say I was losing my time? The advantages I have gained by knowing John Keats are double and treble any I could have won by any other occupation. Farewell. Throughout Keats’s latter days Severn was much cheered by the sympathy and constant attention of Dr. and Mrs. Clark, and of Mr. William Ewing, an English sculptor, who had a profound interest in the dying poet, and was eager to be of any service to him, or his devoted friend. But at last the inevitable moment came. And so the long tragic episode comes to a close, and with the relaxation of the severe strain Severn gave way completely. Even four or five days later, he could not at first sufficiently control his grief to finish a letter he began, intended for Brown. 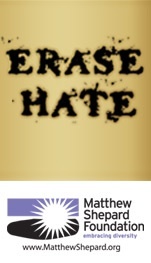 The fragment remains among his papers. The letter is scrawled, and as though written by a tremulous hand. It breaks off just over the second page, and on the third is a roughly drawn but suggestive figure of one mourning. John Keats was buried in the Protestant Cemetery in Rome. Joseph Severn died on August 3, 1879 at the age of 85. He too was buried in Rome’s Protestant Cemetery, alongside John Keats. The graves of John Keats (left) and Joseph Severn side by side in Rome’s Protestant Cemertery.